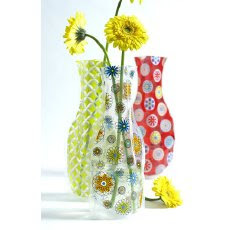 I found these cute collapsible vases on the dollar isle at Target. They are flat plastic until you fill them with water (easy to sneak them in your purse). Wait for an opportune moment. Sneak in wildflowers. Add water from water bottle. Leave note declaring God's lavish love. Run off!